High tech, collaborative spaces that meet the bottomline. A global leader in financial process automation, Bottomline Technologies recently renovated and expanded its corporate headquarters in Portsmouth, NH. The client asked the design team to create interiors which reflect the company’s New England roots and position in the technology industry, and facilitate collaboration so critically important to their teams. A thorough understanding of how people work and their need for proximity led to a variety of private and collaborative spaces. Flexible meeting rooms, casual lounge areas, and cafes accommodate multiple functions while transparent materials provide privacy when required. Glass and aluminum contrasted with soft neutral colors and textiles to create a “cutting edge” environment that is also warm and inviting. 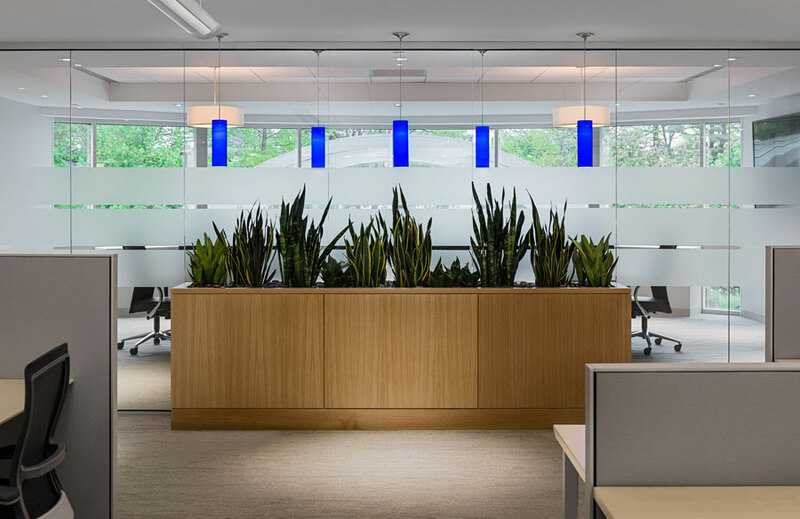 The building finishes relate to the company’s brand color – Bottomline Blue – and are carried throughout satellite locations including Connecticut, Maine and New York.